"I still think of our holiday and the football was truly a highlight! Thanks very much. The atmosphere was really good. Rosie and I went straight to the bars as soon as we got to our hotel room. Mingling with the English and Slovak fans was cool fun. Lots of singing and friendly banter between the two groups, but never any bad feelings. It was great. When the national anthems played in the stadium, it was deafening! We were behind the goals with a large section of English fans, and to our right, in the corner was a large group of Slovakian fans. They sung loudly too! We are already planning our next trip to the northern hemisphere. We will probably go to England this time around Christmas 2017/18 and go to Old Trafford, Anfield, and a few other places. Thanks again for all your help Vincent. Hope to see you again at a football match soon!" Just a quick note to let you the 2 days I spent in Roland Garros were really excellent! Looking forward to experience much more great times around sporting events with Pacific Attitude"
"I just got the feedback from people we invited to Roland Garros through Pacific Attitude – they simply had an exceptional day. Everything went really weel and the greeting was fantastic – a warm and infinite thank you for the great organization . Shall we have further projects around sporting events, we will naturally get back to you !" 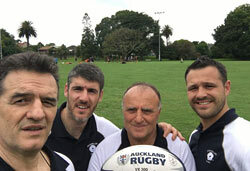 The Montpellier Herault Rugby Association had planned to tour throughout New Zealand for their Youth Development project they have been leading for few years now. The aim was to soak into the World's best rugby nation to get inspired and share the training method leading to such a high and competitive level. Pacific Attitude set up their entire itinerary, touring the North Island from Auckland to Wellington, touring across Waikato, Taranaki and Manawatu. In addition to their generic travel arrangements (flights, accommodation, rental car) Pacific Attitude has offered its expertise with connecting them with the best interlocutors to allow optimized results for their quest. Further than this rugby experience, our team has done its best to allow a bit of time to discover the kiwi lifestyle and share some great times with the locals – a true success! Another field where Pacific Attitude can take you to ! Dear Pacific Attitude team, Just a quick note to thank you for the excellent organization of our trip! We didn't face any issue during the entire length of our stay – everything was well set up from accommodation to transportation, including visits and all contact made with rugby clubs, school etc. in both Auckland and Manawatu. Also, many thanks for putting us in touch with Marc, a real character, who has offered his time and his hosting expertise! We will definitely contact you again shall we have to get back to NZ or discover Australia ! “It was a great shared experience with my daughter (and supporters!) – even if it was more challenging than we had anticipated. Every competitor I spoke with appreciated and acknowledged the organisation surrounding the event. I have no doubt that Lagardere saw this as a trailblazer event, and no corners were cut – it was evident everywhere we looked. On the other hand, your personal attention and assistance was perfect. I really am most satisfied thanks." "I crawled into the office this morning – Monday – for the first time, so being back to work has not happened in reality yet. The race was superb, the people were amazing and the country is simply so beautiful it is almost like a dream. There were a few – very few – issues but that had a lot to do with my understanding of the way things work – however all was booked and in place when we sorted out the details. I certainly learnt a lot of things that will make the next time much easier. Both Jo and I are adamant we will be back – hopefully, from my side, for next year's race and from Jo's just to be there again and to enjoy the serene nature of so much unspoilt beauty and splendour. The people are so good natured and relaxed, but trying to locate a real fixed accent is difficult as there seem to be so many. Blown away would be a good way to describe how I feel about Kiwi land. Thanks for all your efforts and work and just be aware we will probably need your help again next year. So sorry I haven't emailed before now. We have been trying to get back into 'reality'. We were just reflecting today as to what an amazing holiday we had. Everything just ran so smoothly and the weather and snow conditions were/are unbelievable. The Mecure was great and the views (of course) were fabulous! We ventured out to see Arrowtown (a long time wish) and the bird life park in Queenstown on the final day ... but WOW... the winter games action at Cardrona was fantastic! My kids are sold on Cardrona, they love it and really want to go back. Personally, the first 6 months of this year were terrible for us, however this trip has really kick started the second half of 2015. For our family this trip was a wonderful and an amazing gift. "Thanks to Pacific ATTITUDE, everything ran like clockwork and I was able to get plenty of good things done for a first trip (as you would have seen from my list of excursions!). Vincent Delmas is a good connection to have down there. He tries to offer one an original experience and he's eager to please (the first time I met him he offered me so many suggestions that I found it hard to take them all in one sitting!) He also convinced me to do something that I didn't seriously think I would do on the trip: go training with the locals at Ponsonby Rugby Club! I'm really glad that I did it and it is something that I'll never forget. He came through manfully when there was a real problem on the morning that I was due to depart from Queenstown to Hamilton in advance of the third Test match. There was a technical glitch which meant that the plane that was supposed to be flying to Hamilton that afternoon was no longer in a position to fly. But Vincent got everything sorted that morning and had alternative flights arranged for me, even before I knew that there was a problem in the first place. He had the problem solved even before I knew there was a problem! When in Christchurch I spotted the opportunity to do the "Tranz-Alpine Express" which is a very interesting and comfortable panoramic railway journey across the "Kiwi Alps", from Christchurch on the East coast to Greymouth on the West coast. Indeed, I would recommend it to any future clients of Pacific ATTITUDE who are travelling to New Zealand, it is a good day trip. My lodgings throughout the trip to New Zealand were safe and comfortable. It is also worth mentioning that it was a lovely young family who ran the Ambassador Motel in Hamilton. I would recommend them to others. There were lots of little tips and insider knowledge that Vincent imparted to me during my trip, which I am grateful to him and to you for. Tips such as, for example, the imperative of dining at Ferg Burger while I was in Queenstown (the finest burgers in New Zealand apparently). Queenstown also afforded me the opportunity to go Skydiving, which was an incredible experience that I will never regret doing. In this case, Vincent gave me the good tip of jumping off at 12,000ft, rather than at 9,000ft which I had initially planned to do for reasons of comparative cheapness. But Vincent wisely advised me that this would be a false economy, and I duly opted for 12,000ft! Thanks again to Pacific ATTITUDE for the work done to allow Killester Travel to be the only agency in Ireland (I think) to have offered a package trip for Ireland's 2012 Summer Tour to New Zealand for supporters.